Military injuries do not always happen on duty. 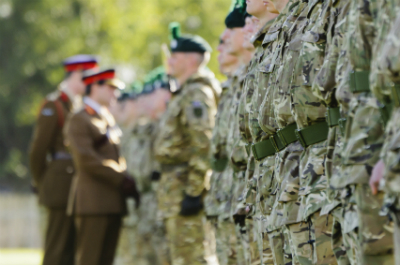 Our specialist military claims team has helped many service men and women to claim compensation for an injury they suffered off duty. At Bolt Burdon Kemp, we understand that overall health and fitness has a massive impact on military careers, and that off-duty injuries can severely affect the financial future of military personnel. If you think an off-duty injury was caused by negligence, talk to our military claims team for specialist advice. We usually work on a no-win, no-fee basis, so get in touch today. Who will you claim against? Depending on how and where the off-duty injury occurred, a claim can be brought against the Ministry of Defence or a third party, such as a civilian or hospital. An example of where a claim might be brought against the MoD would be if a senior officer allowed a service man or woman to jump off a high bridge during R & R, causing an injury. Here the MoD has breached its duty of care. Alternatively, a claim can be brought against a civilian if, for example, a member of the services was involved in an accident caused by that civilian, for instance in a car collision. Whoever a claim is brought against, it must be remembered that the injury could have a radical effect on that service man or woman’s career and could even lead to a medical discharge. It is very important to be represented by specialist military claims experts when claiming for off duty negligence. A solicitor without experience of putting a proper value on the loss of a military career will have difficulty making sure the compensation claim accurately reflects the loss of this career. A service person has a right to choose their legal team with this knowledge. In a case where a claim is being made against a civilian, the military victim’s legal expenses insurer may refer them to a solicitor on its panel of firms. In these circumstances, the service person has the right to decline and choose a legal team with the necessary experience. Alternatively, a negligent driver’s insurer will sometimes make an offer. Before accepting, service personnel should seek experienced legal advice to ensure that they are being offered a sum that properly reflects the severity of the injuries sustained and the possible loss of their career. For example, a client of ours was offered £4,000 by a civilian driver’s insurer for an injury that turned out to be career-ending. Fortunately, she came to us. We advised her that this figure was far too low and we secured a settlement of £600,000. Find out more about our successful cases here. It is important to note that the Armed Forces Compensation Scheme doesn’t compensate for injuries sustained off duty, but that the civil courts will award compensation if negligence caused harm. There are also time limits for bringing the claims mentioned above, so it is imperative that expert legal advice is sought as soon as possible. Please read the main military claims page for more information about time limits. Contact us today to discuss bringing a claim for an off-duty injury.